Mike To Join Nelson in Trafalgar Square! 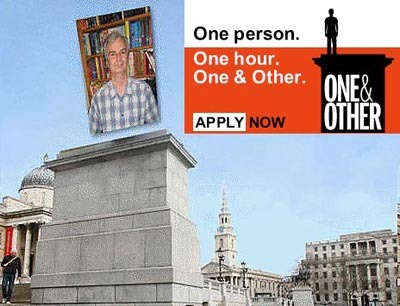 Briggensian Mike Holmes (1972-77) has been selected to take part in Antony Gormley's project One & Other, in which UK residents each spend one hour this summer occupying the Fourth Plinth on Trafalgar Square. Every hour, 24 hours a day, for 100 days without a break, a different person will make the Plinth their own. If selected, you can use your time on the plinth as you like. One & Other is open to anyone over 16 from anywhere in the UK. "They will become an image of themselves, and a representation of the whole of humanity", says the sculptor. Mike need not be the only Briggensian! You can apply by clicking the text link or the image to visit the project's web site. Mike will be on the plinth on Wednesday 8th July between 5 pm and 6 pm. He writes "If there are any fellow Briggensians around in London then please drop by and have a look. My support team - the lovely Ruth - will be in Trafalgar Square, so make yourself known." You will also be able to view the Plinth from home - the One & Other web site will feature a live web cam, Mike doesn't say what he will be doing up there, so we'll just have to watch to find out. You’ve just read the headline and you are thinking – that’s not news, I attack them every year in the garden. But there’s a Briggensian whose cutting-edge battle against aphids is in a different league. Tom Wilson’s fight against aphids such as wooly aphid, greenfly, whitefly and blackfly has made the local and national press. Briggensian Tom (who entered SJN in 1989) is a tree surgeon in the Oxford area, working for Jenks Group Ltd. The problem with aphids is that they feed on tree sap and then excrete a sticky substance known as honey dew which drops from the trees onto whatever is below – paths, patios, benches, tables, cars and so on, causing a nuisance and hefty cleaning and repair bills for homes and businesses. 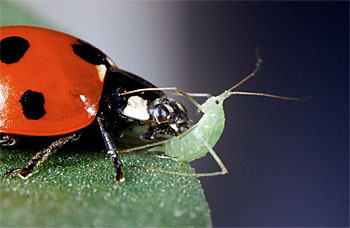 Natural predators of aphids - ladybirds and lacewing larvae - are used in horticulture to control aphid infestation. However an extra problem with tree colonies is that aphids have a powerful ally – ants which harvest the honey dew and “farm” the aphids, to the extent of rescuing fallen aphids and killing the ladybirds and the lacewing larvae. So Tom Wilson has researched and evolved a method of using these predators whilst keeping the ants at bay. Ladybirds and larvae are introduced into the crown of the tree whilst a glue band near the base of the trunk provides a barrier to the ants. For Tom one of the most satisfying things about this work is that he is able to save many trees such as sycamores, planes and limes from being chopped down by house-owners, businesses and local authorities. Tom’s innovative work for Jenks Group has been featured in the Oxford Mail and by the BBC. From Scarborough, John has sent us a memoir about his years as a pupil at BGS, surveying, water jumps, athletics and Mr D V Adams, whom he met again after 42 years in 2008. You can find it in the Library. Congratulations to Frank Holmes on his Century! “I thought you might be interested to know that my Father, Frank Holmes, who was an old pupil of your school, will be celebrating his hundreth birthday on May 3rd this year. I made a visit with him to the school 12 or so years ago when the Headmaster at the time was kind enough to show him around and looked him up in the old year books. I recall that an article about him and the visit appeared in the school magazine at that time, a copy of which you kindly forwarded to him. He left the school around 1926 when he was Captain of Football and has many happy memories of his time there. From school he joined the Midland Bank (HSBC) and retired from there at the age of 60. He has now been one of their pensioners longer than his working time with them! “Thanks very much for sending me a copy of the 2009 Association Newsletter. It was good to read about Bumper's Retirement ceremony in July 1958, but I was sorry to learn of the deaths of Vernon Atkin and John B Bell, both very good teachers who taught the first year entry form (IIIa) in 1957 – 58! Obviously Vernon taught French but John Bell was our form master and took two subjects – English and Geography. A fine man!" “Recently I came across John A Rhodes's “Remembered with Advantages” (Brigg Grammar School 1941-48 Memoirs) which impressed me greatly and brought back many memories. I presume you have his address and I would be most grateful if you could complete his address on the enclosed envelope and forward it on to him. I will be pleased to reimburse any costs involved with a money order.